Gina believed that the egg whites weren’t necessary and she wanted to stick to the original recipe which didn’t have any egg whites in it. I asked Rita how her mascarpone mousse had achieved such fluffy texture and she explained that she had used a little whipping cream as well. The guys didn’t seem that interested in our conversation, they were more interested in having seconds, but we carried on talking and I smiled at the idea that four ladies, who all made tiramisu regularly, managed to prepare it in different ways. Some used cream, others didn’t, some used egg whites, others didn’t, some used coffee, others used alcohol, some used sponge fingers/lady fingers, others preferred sponge cake instead. And I’m only talking about the classic, the traditional tiramisu. Don’t even get me started on the other variations of tiramisus. Because then our conversation moved on. Rita, for example, revealed that she made a mean orange tiramisu, and also a pineapple one. Laura, while we were at it, told us about her wonderful banana tiramisu, Gina mentioned trying a fantastic limoncello one at a restaurant. While I was listening with my mouth open, I remembered how at some children’s parties I had noticed tiramisus for children without coffee or alcohol, or some really cute tiramisu cakes, or when once my sister-in-law during a hot summer evening, after coming back from the beach, offered me a slice of strawberry tiramisu. So, one day, when back home I was making my chocolate tiramisu, I thought again about all these ways in which we make tiramisu in Italy, and I realized that I could gather all these recipes in a book and share them with others. That’s how Tiramisu Recipes from Italian Friends and Family was born. The recipe below is from the book…enjoy! 1) Separate the eggs, placing all the yolks in one bowl and the whites of 3 eggs in another bowl. Discard 2 egg whites. 2) Whisk the yolks with the sugar until you get a light, pale mousse. 3) Add the mascarpone, and mix until you obtain a smooth cream. 4) Beat the egg whites until they form stiff peaks. 5) With a wooden spoon, fold the egg whites into the mascarpone mousse, with slow movements, working from the bottom of the bowl upwards. 6) Choose a serving dish for your tiramisu. Line the bottom of the dish with a layer of half of the sponge fingers. 7) Pour some coffee over the sponge fingers, enough to moisten them, but not to soak them completely. 8) Place a layer of mascarpone mousse over the sponge fingers. 9) Dip the remaining biscuits in the coffee and put another layer over the mousse. 10) Cover the biscuits with another layer of mascarpone mousse.Decorate the top with grated plain chocolate or dust with cocoa powder. Refrigerate for four hours before serving. Suggestions: the traditional tiramisu recipe uses cocoa powder, but sometimes Giulia prefers to use grated plain chocolate to decorate the dessert. 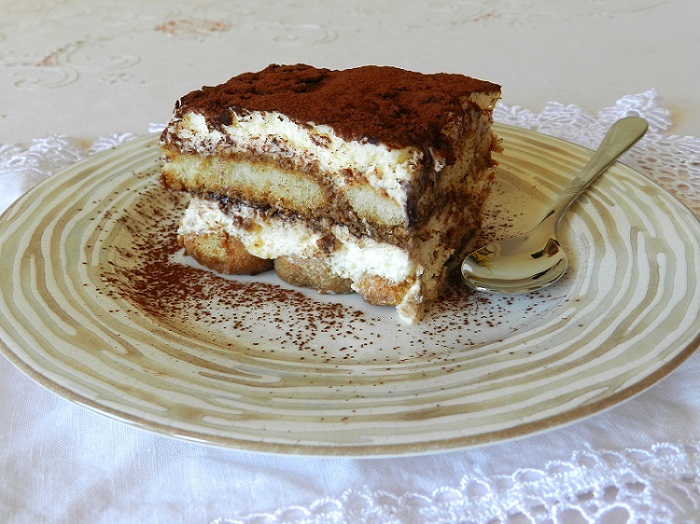 The quantities for this tiramisu will fit a dish of 22 x 25 cm (8½ x 10 inches), with two sponge finger layers. But it’s important to remember that you can have as many layers as you want. You could have a smaller dish with three layers, or a larger dish with one layer. You might also like to serve this tiramisu in single glass cups. 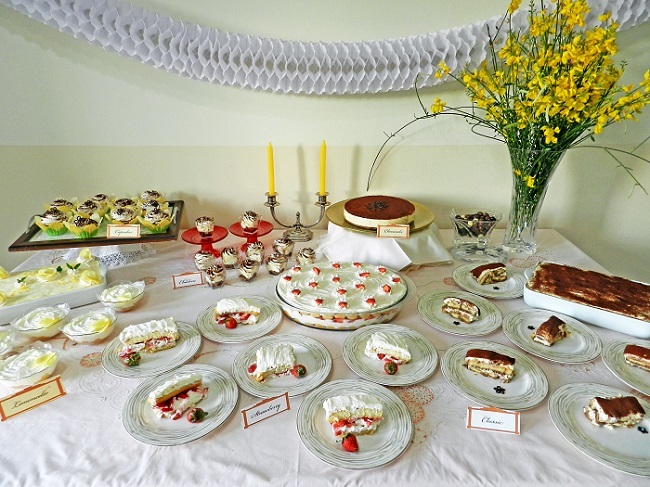 For more of the recipes seen in the photo below get yourself a copy of Tiramisu Recipes from Italian Friends and Family.